The clock ticks, time bends, space shifts, and Oprah Winfrey is your planet-hopping tour guide through all of it. Disney’s upcoming fantasy epic is about an ordinary teenager named Meg (Storm Reid) who’s whisked on a cosmic adventure to find her missing scientist father (Chris Pine) with the help of three chimerical celestial beings who help her “wrinkle” time and space: philosophizing Mrs. Who (Mindy Kaling), inquisitive Mrs. Whatsit (Reese Witherspoon), and wizened Mrs. Which (Oprah Winfrey). The film is due in theatres March 9. 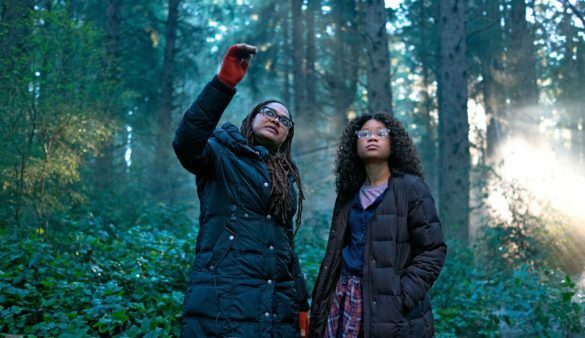 To accompany Meg on her interplanetary journey, DuVernay recruited three world-class actresses to inhabit what are perhaps the best remembered parts of A Wrinkle in Time — the magical trio of eccentric guides, whom DuVernay describes as “three Mrs. Doubtfires.” The director saw an immediate casting opportunity to expand upon the literary archetype of three wise women and rise to her own personal challenge in pushing this film past what could be construed as traditional limits. “My whole process with this film was, what if? With these women, I wondered, could we make them women of different ages, body types, races? Could we bring in culture, bring in history in their costumes? And in the women themselves, could we just reflect a fuller breadth of femininity?" First up was Mindy Kaling, who plays the enlightened Mrs. Who. “I wanted a black Mrs., a white Mrs., and a Mrs. that was not either, and Mindy was the first one that came to mind. I feel like we don’t talk about a lot of the other colors and cultures enough, and Mindy is so beautiful to me. Her character is one that, in her costumes and in working with Mindy, we wanted to bring in a remix of styles and cultures and customs from around the world. She was a real partner in that. She was working with two legends, but I think she’s a legend in the making in terms of what she does and being a fresh voice as a comedic actress." Reese Witherspoon plays Mrs. Whatsit, the youngest of the three celestials, “clocking in at a prepubescent 60 million,” laughs DuVernay. “I was looking for that innocence, that thing Reese plays so well, but also that great power and precision, and funny. The character has so much funny going on, you really need someone who’s proven and who’s done a bit of it all, and that’s Reese. It was so lucky that she was a fan of the book and wanted to come play with me." Guiding Who and Whatsit is the most legendary guru of all: Oprah Winfrey, who plays Mrs. Which, a powerful sage with a knack for materialization. “I mean, when you’re trying to cast the wisest woman in the world, what’s the question? You go and you call her and you’re glad that you have her number on speed dial,” DuVernay beams. “[The character] is so much of what she teaches and shared through her shows over the years, through her magazine and OWN, about owning your light and conquering darkness and how we have to power ourselves through this life in a certain way and look out for each other. She dropped into the character so well, but it’s also Oprah. When we see her in Henrietta Lacks, she’s not Oprah to me. When I saw her in The Butler, she became Gloria to me. But in this, because of the things that Mrs. Which says, her Oprah-ness is really helpful."